All images copyright © 2017 by Lois Bielefeld. No reproduction without permission. In terms of attendance, compensation, and overall media presence, women’s sports are almost always eclipsed by those of their male counterparts. This gender imbalance trickles down to the high school level, where there are often more opportunities and resources for boys. What does this communicate to girls about their value as athletes—and as young women? My daughter entered Shorewood High School in 2014, and, despite my anxiety, it was a smooth transition. I attribute this mainly to her joining the cross country running team. I was an art kid in high school and never participated in organized athletics. 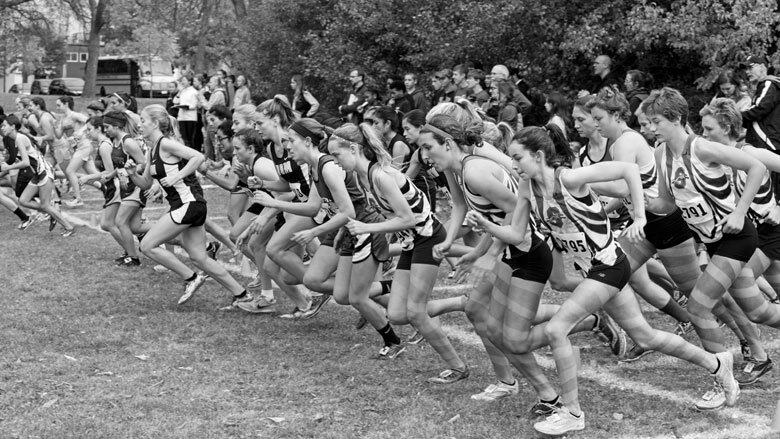 Yet even I noticed there was something different about the cross country team: these young women joined primarily for the sense of community they found here. For many, the running came second. During the team’s 2015 season, my camera followed 61 high school girls, two dedicated assistant coaches, and head coach Sarah Kopplin (whom the girls call “Spence),” in an attempt to understand how organized sports can contribute to a young woman’s sense of self. I participated in a three-day camping trip, eight 5k cross country meets (including bus trips to and from), and numerous in-home pasta dinners on nights before meets with all—yes, all—of the girls. I never thought I would do a sports-themed photography project. Not long into it, I realized I wasn’t. At least, not entirely. Instead, I was making a documentary coming-of-age project about bonding and self-development, and capturing the vibrant space in which it all happens. The Shorewood Girls Cross Country Team’s 2015 motto, All In, reflects the kindness and respect these girl show each other as well as the cross country runners from other schools. It also signals their full participation in the traditions and rituals that foster community and a sense of belonging. And, perhaps most important, All In means that each girl gives her all to her teammates and, in turn, discovers an inner strength she never knew she had. Lois Bielefeld is a series-based artist who works in photography, film, audio, and installation. Her work is in the permanent collections of the Leslie-Lohman Museum of Gay and Lesbian Art in New York City, the Museum of Wisconsin Art, and the Racine Art Museum.